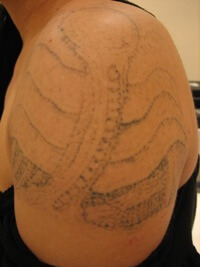 Looking for the best laser tattoo removal or fading… here at Radiant Living we know how to do it! Whether you have a professional or amateur tattoo, we will assess it and give you honest free advice. We use the most advanced active Q-switched medical grade laser (not a passive laser as used by many tattoo studios.). This means that the pulses of light are stronger and break down the ink in your tattoo more effectively. 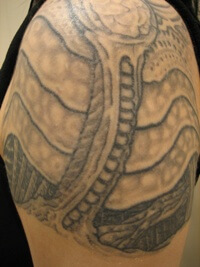 Your body’s immune system then removes the particles, gradually fading the tattoo after each session. Our laser technicians are trained and accredited by British manufacturer Lynton Lasers in conjunction with Manchester University. As our lasers are the more powerful than passive systems it means we will be able to remove your tattoo in fewer sessions. That said it’s not a quick process. Tattoo removal can take anything from 5 to approximately 15 treatments. This really depends on many different factors, including the location of the tattoo, the type and density of ink, and your immune system. You need to start your laser tattoo removal journey somewhere… start it with a free consultation. Call 01257 463464 to arrange a chat. Please book a free consultation for any laser treatment, when we will be able to give advice and carry out a test patch. Our clients travel from all over the North West for our services, including Wigan, Ormskirk, Southport, Chorley, Warrington, Preston, Manchester and Liverpool.